At this rate, the flinty toughness that President Obama has tweaked Washington for lacking when it comes to winter weather may soon be forged through sheer necessity. Another epic blizzard hammered Washington on Wednesday morning, paralyzing anew a city that was still struggling to dig out from a storm that dumped some two feet of snow on the nation's capital over the weekend. The frigid blast, which is expected to blanket Washington's beleaguered residents with another 10 inches or more, left travelers stranded, shuttered airports, snarled rail and road traffic and brought the federal government (yet again) to a standstill. For a third straight day, about 230,000 federal employees were forced to stay home  a stoppage that Office of Personnel Management director John Berry has said costs taxpayers an estimated $100 million per day in labor that workers are unable to perform. With forecasts darkening on Tuesday, House majority leader Steny Hoyer canceled votes for the rest of the week, while the Senate called off votes slated for Wednesday. For what might be the first time ever, says Fred Beuttler, the House's deputy historian, the chamber's cafeteria was forced to close. Major hearings on Capitol Hill were postponed, including a congressional probe on Toyota's slew of safety recalls. Flights at Washington-area airports were grounded, Amtrak service was severely curtailed, schools were closed and mail service was suspended. Even plows were ordered off the icy roads in Washington's Maryland suburbs after administrators determined that snow removal was too treacherous a chore. The gridlock afforded residents of the nation's balmier regions occasion to snicker about D.C.'s reputation for panicking when faced with even the lightest of dustings. But even Obama, a Chicago transplant, acknowledged over the weekend that the city's "Snowmageddon" was formidable. The National Weather Service urged drivers to stay off the roads on Wednesday morning, citing "life-threatening blizzard conditions." Swirling winds of up to 60 m.p.h. were recorded, whipping up near whiteout conditions, with visibility at Dulles International Airport outside Washington about one-tenth of a mile. Thousands of people in the region went without power. The storm, which originated in the Midwest, was barreling up the East Coast on Wednesday, battering Baltimore, Philadelphia, New York City and Boston, forcing preemptive school closings and spurring officials to slash air travel. Even before the latest pummeling, Washington had recorded 45 inches of snow this winter, including two of the heaviest storms ever to batter the city. Wednesday's storm  with some six inches recorded already, and snow falling at a rate of as much as two inches per hour at mid-morning  is poised to shatter a 111-year-old record for total seasonal precipitation. "No one ever has seen this much snow in Washington, D.C.," according to Mayor Adrian Fenty, who said on Wednesday that the city would ask the federal government to foot some of the cleanup costs. The city's Department of Transportation director of communications, Karyn Le Blanc, told TIME that plow crews were on their ninth 12-hour shift clearing snow, a stretch that dates back to the weekend's blizzard. "Mother nature has a very weird sense of humor," she quipped. More snow is expected next week. Officials in Washington and Virginia said they would press to have Obama declare a federal emergency, which would unlock FEMA funds to help with the recovery. Hoyer told reporters that Congress would consider providing federal disaster assistance to help the city dig out from the "historic" storm. But if it will vault the city into history books, the onslaught also predictably wreaked havoc. In a city of mostly flat roofs not built to withstand heavy snowfall, leaks were widely reported; in Alexandria, Va., officials were searching as far away as Florida and Texas to find 30,000 tons of salt for snow removal. Near downtown Washington, trees remained strewn across intersections. The paralysis is "another example of how poorly the federal government responds in times of stress," says Paul Light, a professor of public service at New York University. Beuttler notes that the House's telecommuting system, created in the aftermath of the Sept. 11 attacks and signed into law by President George W. Bush, enables members to work remotely. But visitors to the capital seemed dumbstruck at the chaos the storm had wreaked on normal civil functions. 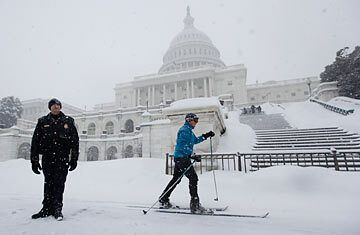 "It's embarrassing that the world's largest superpower closes from a few feet of snow," a 23-year-old tourist on the National Mall told the Associated Press. "The Kremlin must be laughing." They wouldn't be the only ones enjoying a moment of levity amid the cataclysmic weather. "It's going to keep snowing in D.C. until Al Gore cries uncle," Republican Senator Jim DeMint of South Carolina wrote on Twitter. But with the snow still falling, locals took advantage of the time off to tromp through the picturesque drifts piling up on mostly vacant streets. In the Dupont Circle neighborhood of Washington, where a Facebook-fueled flash mob engaged in a massive snowball fight on Saturday, residents skied through deserted intersections, shoveled off stoops and walked their dogs  trying, perhaps, to maintain a hint of normalcy in extraordinary circumstances. Read "Another Blizzard: What Happened to Global Warming?" See pictures of ice and snow sculptures.